Ragdolls have come a long way in four decades, due in part to the efforts of early breeders such as Laura and Denny Dayton. 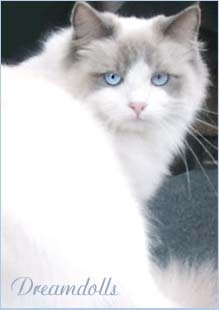 The Daytons bred the ragdoll to the point of standardisation through an extensive and selective breeding program, they are also responsible for the ragdolls introduction into Europe via the United Kingdom. Mitted Pattern, The legs (except for the feet), ears, mask and tail are a well defined color. A white blaze (broken or evenly matched on each side) on the nose or between the eyes is acceptable. The front feet are to have evenly matched white mittens (toes) . Color Point Pattern, Color points have ears, mask, feet and tail of a darker color. The lighter body color is to be sound to the roots. Bicolor pattern, the ears mask and tail are defined in color. The mask is to have an inverted white “V” which should be the same on both sides and not extend past the outer opening of the eyes. The chest , stomach and all four legs should be white. The color on the body is to be lighter than the points, with markings of white. 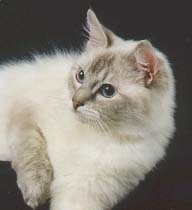 Lynx point Ragdolls and Red point (or flame point Ragdolls as they are sometimes referred) and their red gene derivatives ie Cream points, Tortie points and Torbies are the latest to gain acceptance for championship status in the USA. Having been accepted for championship in May of 1998 with TICA (The International Cat Association) they were subsequently accepted by CFA; However, they had already attained championship status in Canada prior to this. The temperament of ragdolls is very similar to that of puppy dogs, they are devoted, affectionate, out going cats that are known for their fearless nature. Ragdolls are totally non aggressive indoor cats.Although a very large cat, their Meow is so quiet that they cannot always be heard and despite their size they want to be lap cats. 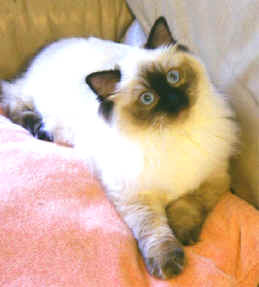 Ragdolls are slow to mature and full coat and color is not generally reached until they are two years of age and full size is usually achieved at about four years. New born kittens are born completely white or cream and color does not start to show for about 3 or 4 days. 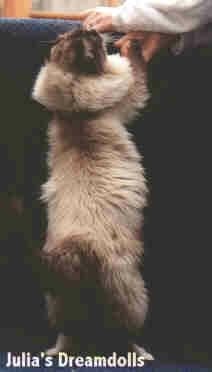 It is quite amazing that in so short a period of time the ragdoll has found itself to be one of the most popular breeds of cats in the world, this says a great deal for these cats. Ragdolls are known for their sweet temperament and also the tendency to go limp when picked up and held but this is not the fact with all ragdolls and the RFC ( ragdoll fanciers club) states that this tendency is not mandatory for the breed. A big plus with this breed is the fact that they shed very little, some call them a non shedding cat but low shedding would be a more appropriate description. The fur is also considered rabbit like in its silky, non matting texture. Ragdolls do not suffer with runny eyes as do some breeds and are considered a very hardy animal with no known genetic defects and they are not prone to any specific diseases. They are a peace loving cat who, as adults, are not overly energetic thus making them the ideal apartment cat and well suited to the nineties. Unlike most cats ragdolls love to have their tummies rubbed and will roll over on their backs and enjoy this treat, you will find that the muscle tone of the ragdolls belly is soft and unlike any cat you have felt..